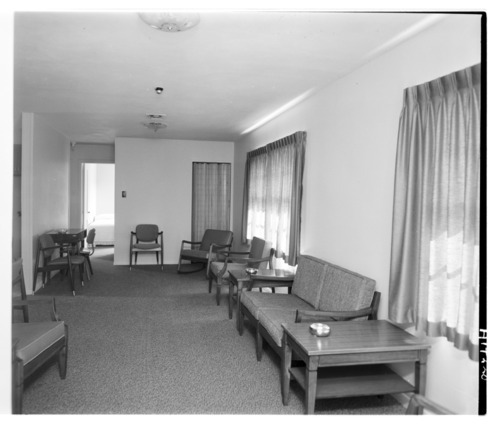 These two photographs show the day room and a bedroom in the Retirement and Geriatrics Center of the Menninger Clinic in Topeka, Kansas. In 1970, the building was converted into the Short-term Diagnostic and Treatment unit. This was one of the buildings added to the original "East Campus". The surrounding 20 acres were developed with buildings and gardens. In 1985, the "West Campus", a much larger area, was developed west of Topeka as a residential scale community of 28 structures on a 350-acre hilltop campus. In 2003, the Menninger Foundation was moved to Houston, Texas.